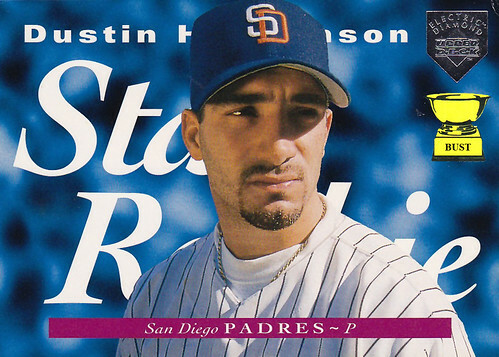 San Diego Padres' scouting report on "Sta_ R___ie" Dustin Hermanson: "Massive head, which blocks everything in its path, including hyperbolic baseball card labels. ... If Hermanson fails, monobrow may have a future in organization. ... Need to keep an eye on his candy addiction. ... Collar could one day mature into a mock turtleneck; with luck, a full turtleneck. ... Looks good plastered against a sea of blue, despite sophomoric facial hair."